Poke cake is so called because once it's baked you simply poke holes in it! Then you pour a delicious runny topping into the holes; and when the cake is fully finished you can't see the holes as they are covered with more topping. Then when you cut it, everyone gets to see the scrummy gooey filling in every slice. See what I mean - sticky, gooey caramel oozing from the cake and of course the more holes you make the more filling there will be; but with that said don't go too mad or the cake might fall apart! Just recently the lovely people over at Spiller and Tait sent me some of their freshly roasted coffee to try. When the delivery guy arrived at the door you could really smell the lovely aroma of coffee; he even said, no guessing what's in this parcel! On opening the lovely smelling parcel I was amazed to see on the packets the day of roasting (might be just me but I've never seen this before), anyway this coffee was fresh, it was roasted no more than 7 days ago. The secret to good coffee is it should be fresh and apparently Spiller and Tait only roast weekly in small batches so every packet you buy from their website arrives to you with full flavour and aroma. Having started out selling exclusively on Amazon in the UK, Spiller and Tait's coffees rapidly became some of the highest rated and best selling on-line. Now they've responded to this growing demand by selling from their own website, as well as Amazon and other on-line outlets in the UK and Europe. 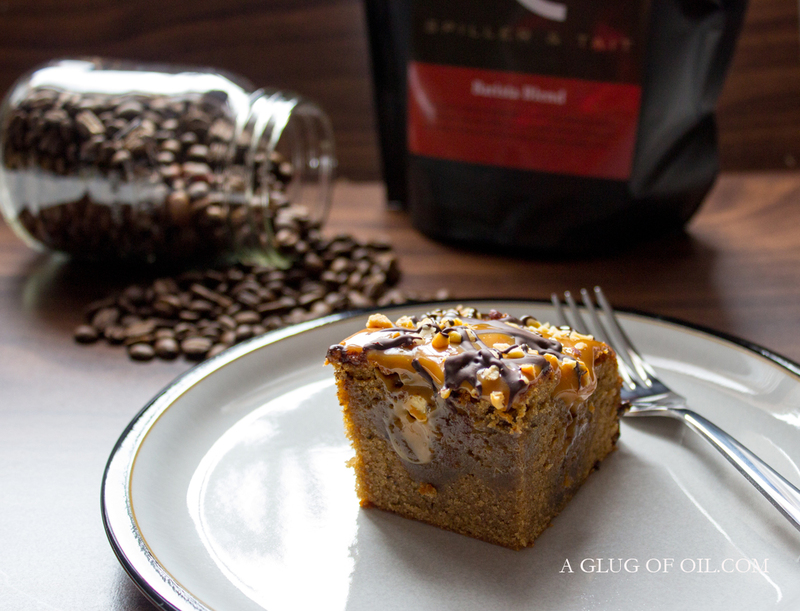 Signature Blend is their best seller but my husband is loving the Barista Blend which, by the way is the one I used to make my cake. Freshly roasted, available as whole beans or ready ground you can read more over at the Spiller and Tait website. Now I'm not a one for cakes but Paul (the husband) does like a bit of cake! I never do much baking because I'm simply no good at it. But having been asked to come up with a recipe using coffee and since I like a challenge I decided to make a cake. Amazingly my made up recipe turned out really well, so if I can make this anyone can! It's really easy because it doesn't have to look 'posh' - yep can be as messy as you like with this one. As this cake is so rich you really don't need a lot and served with ice cream this would make a rather nice dessert and it will go a long way. The addition of 60ml of coffee to the sponge mix made this cake really nice and moist. 60ml of freshly made very strong coffee - made from 2 tablespoons in 80ml water in a cafetiere and left to go cold. Butter and line the base of a deep 20cm cake tin. Measure out all the cake ingredients into a large mixing bowl (except the coffee). Beat together until smooth. Now stir in 60ml of the cold coffee and mix until until thoroughly blended. Pour the mixture into the cake tin and bake in the preheated oven for about 35–40 minutes until golden brown. 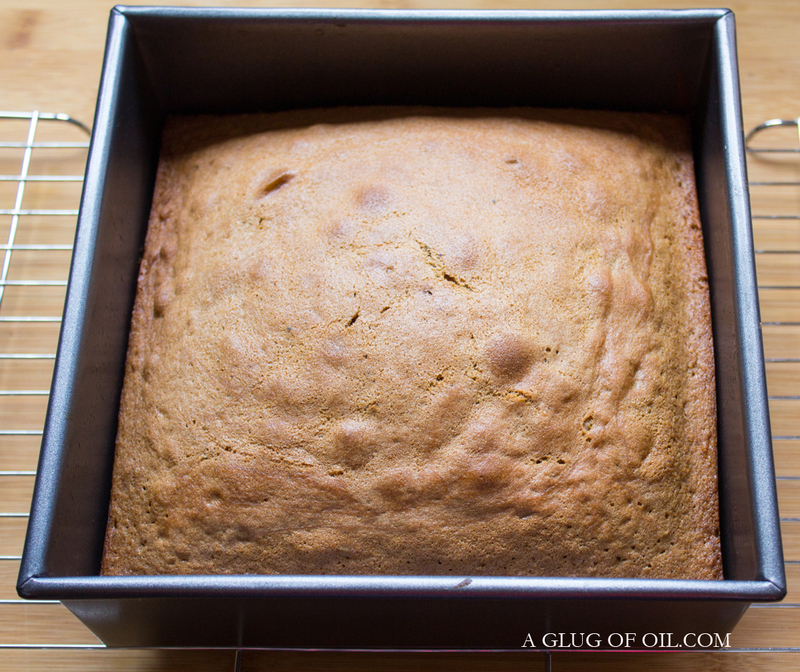 The cake should start to shrink away from the sides of the tin and the sponge should spring back when lightly pressed. Once it’s cooked, leaving the cake in the tin, allow it to cool for a few minutes. Meanwhile gently heat one of the tins of caramel but don’t let it get too hot; just until it becomes pour-able. Now you can poke holes into the cake using then end of a wooden spoon. 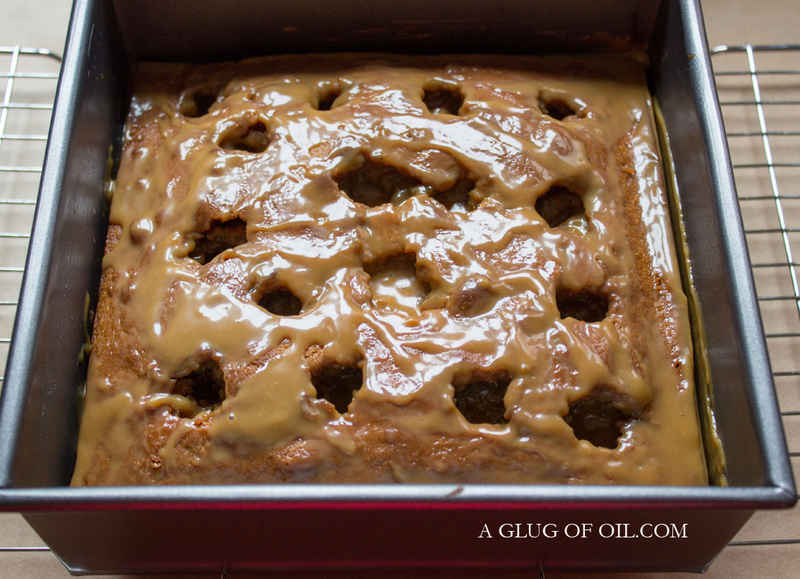 Pour the caramel into the holes and spread the rest over the cake. Now, before continuing put the cake in the fridge for about an hour so the caramel sets. Carefully remove the sponge from the tin; if you don't have a loose bottomed tin you may have to turn it upside down onto greaseproof paper but it doesn’t matter what it looks like as it will soon be covered with the topping. 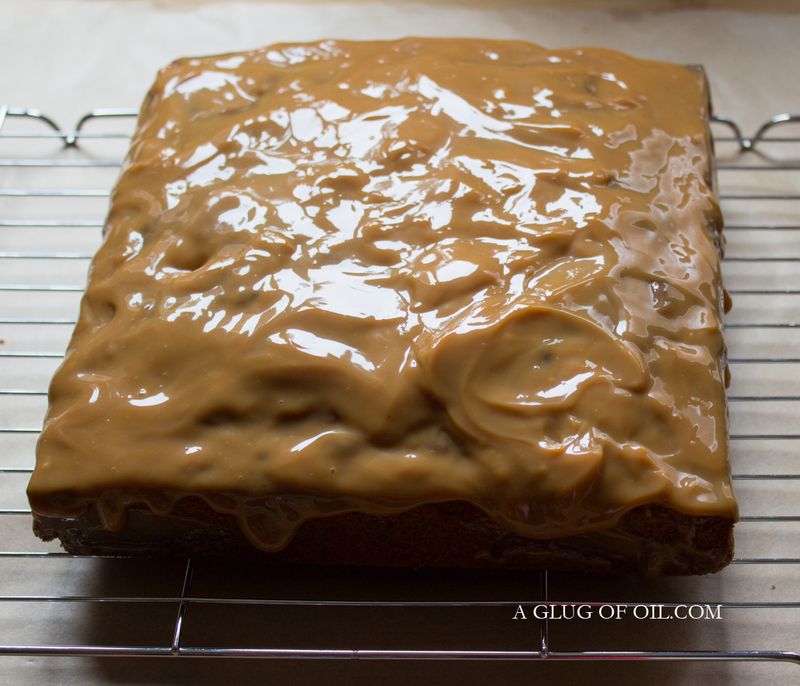 Put the cake onto a clean piece of greaseproof paper and spread the second (unheated) tin of caramel over the top of the sponge; if it’s used straight from the tin you can spread it as it’s thicker than when warmed. Scatter over the hazelnuts and gently heat the chocolate and the honey together. The honey will make the chocolate more runny which is what you want. The best way to heat chocolate is to put it in a heatproof bowl over a saucepan of simmering water. Once melted, dip a fork into the chocolate and using a left to right motion drizzle the chocolate over the cake. As this cake is so rich you really don't need a lot and served with ice cream this would make a rather nice dessert and it will go a long way; although if you have kids and a husband like mine don't expect it to be around for long before it gets eaten. The addition of 60ml of coffee to the sponge mix made this cake really nice and moist. 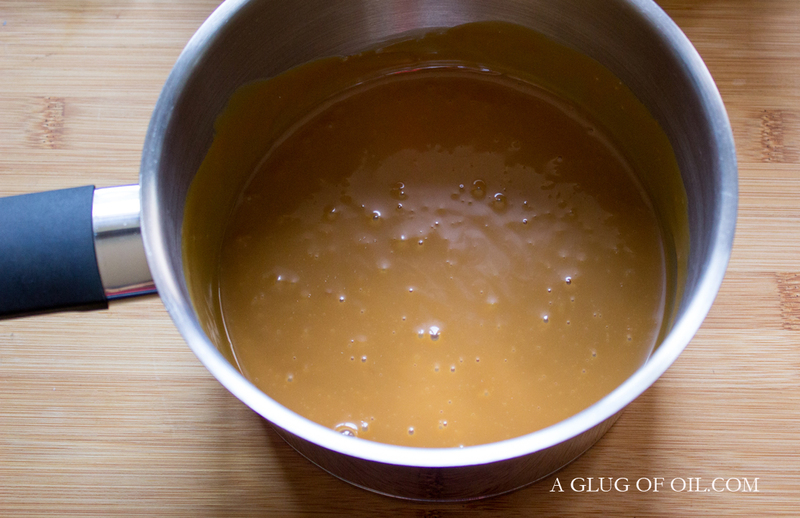 Meanwhile gently heat one of the tins of caramel but don’t let it get too hot; just until it becomes pour-able. Now you can poke holes into the cake using then end of a wooden spoon. This cake can be made the day before up to the point of adding the hazelnuts and melted chocolate, best to do that the day you plan to serve the cake. Oh and it's perfect with ice cream! 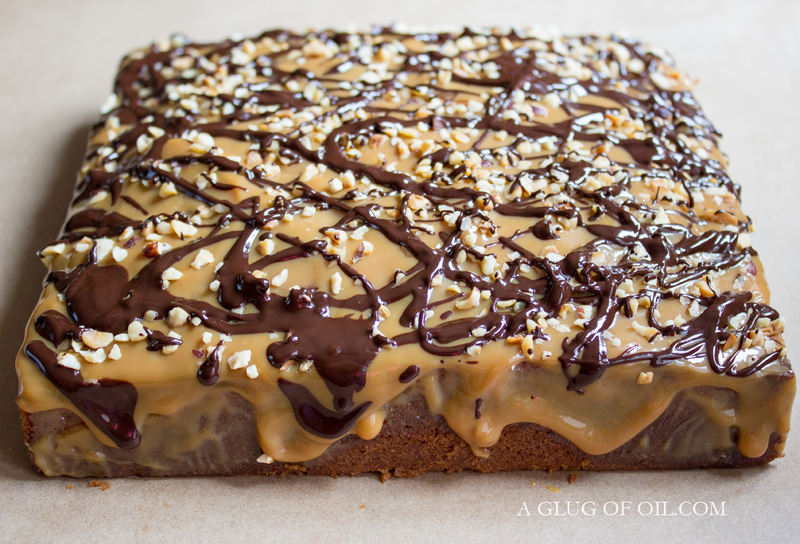 I'll leave you with a shot of the lovely caramel gooey inside, why not make this. 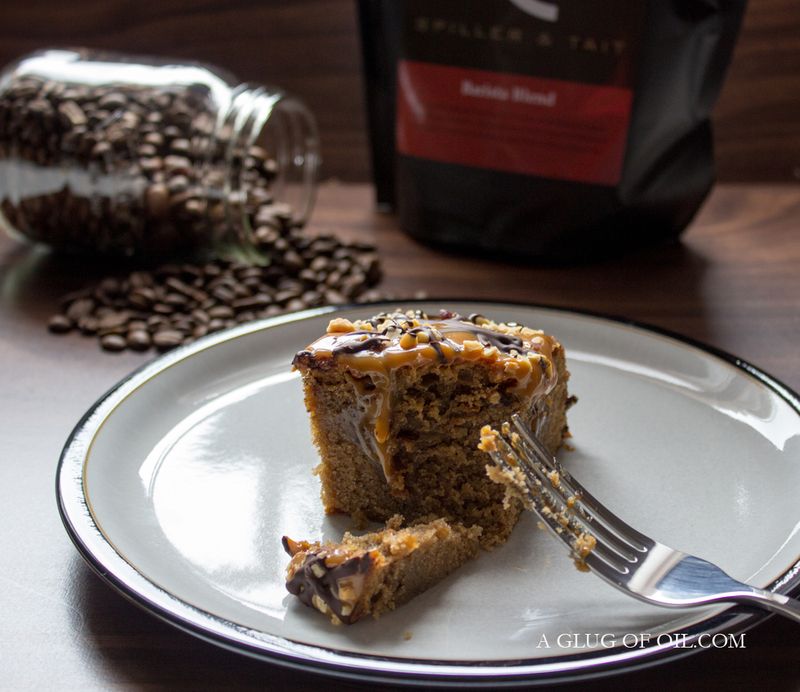 Enjoy with a nice cup of Spiller and Tait coffee. Disclosure: This post in partnership with Spiller and Tait. I received coffee samples and payment to cover the cost of ingredients for making the recipe and my time.